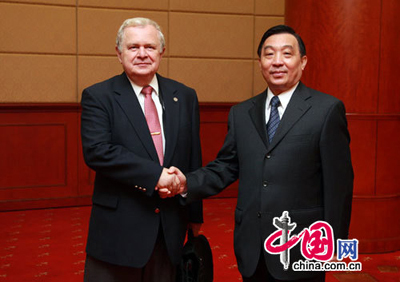 Wang Chen(right), minister of the State Council Information Office, meets Peter Krawutschke, President for 2005-2008 Council of the International Federation of Translators, August 4,2008 in Shanghai,China. Wang Chen, minister of the State Council Information Office talked exclusively to China.org.cn about the Eighteenth FIT (International Federation of Translators) World Congress taking place in Shanghai from August 4 to 7. China.org.cn: What international impact do you think the FIT World Congress will have? Can you tell us something about the preparations for the congress? Wang Chen: In April 2005, when China was selected to host the XVIII FIT World Congress, the country became the focus of the world's translation organizations. UNESCO director-general, Mr. Koichiro Matsuura, recently told FIT that the congress would have a huge significance in addressing the challenges and opportunities facing the translation industry. The Chinese government is paying great attention to the congress. The preparations were strongly supported by both the State Council Information Office and the Shanghai Municipal authorities. A record 1,500 translators from over 70 countries and regions will take part. Representatives of United Nations, European Union and UNESCO will address the congress, as will the assistant secretary-general of the United Nations Department for General Assembly and Conference Management, and the director general of the Directorate for Translation of the European Commission. Many international translation organizations will hold forums and seminars during the congress. The Organizing Committee of the congress has received 1,510 abstracts of academic articles to be presented in the 88 sub-forums. The subject matter covers the relationships between translation, culture, education, the economy, diplomacy, management, and modern science. In terms of both quantity and quality, the articles are the best in the history of FIT. An International Translation Industry Exhibition will be held alongside the congress. The multilingual news site, China.org.cn, will broadcast live reports of congress sessions. The congress has attracted a large number of translators and representatives of the translation industry. As the director of the Organizing Committee of the congress, I expect the congress contribute significantly to the development of the translation industry. China.org.cn: What does it mean for China to hold the FIT congress? What can China contribute to the international translation industry? Wang Chen: The fact that China is hosting the congress reflects China's enhanced standing in the world, as well as the development of its translation industry. Translation is becoming ever more important as China continues to reform and open up against the backdrop of globalization. Translation can help to pool the achievements of different civilizations, and enhance China's influence in the world. The congress is a big event not only in the translation field, but also in the cultural field as a whole. It will also play an active and influential role in introducing China's culture to the world. Many countries have taken a great interest in China's rapid economic development and want to learn more about the country. Holding a congress in China will help promote cultural exchanges between China and the western world.